The use of sound in healing has been recognised since ancient times. Using sound vibrations to heal can be backed up by the scientific proof that everything that exists within our universe consists of pure vibration. This of course includes the human body and its energy systems. Ailments that manifest within the body are created by dissonance within the bodies energy field. This dissonance is caused by particles vibrating at an unharmonious frequency. The key here is to gently encourage the body to effectively change its vibration. It is here that tuning fork therapy plays a vital role in sound healing. These simple tools will provide therapists with a powerful frequency shifter. When the specialist tuning fork sets are applied on and around the body, the specific frequencies remind the body of its natural resonance pattern. As the sound waves travel through the bodies energy field a vibrational shift begins, triggering a re-patterning at a cellular level. A domino effect is initiated in the body, as it is encouraged to restore itself back to its natural harmonic pattern. Vibrational shifts will influence the body on a holographic level, thus aiding in re-balancing physical, emotional and subtle energy imbalances, including those within the aura, chakras and meridian circuits. 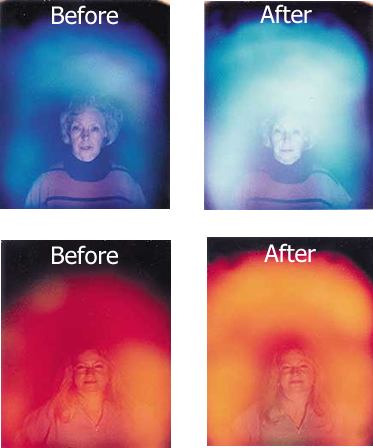 Note: From the Kirlan photographs opposite you can clearly see the changes in the auric field after just 5 minutes of Healing Tuning Fork therapy.